When it comes to parking security, facility operators have a difficult job. Keeping parking lots and garages safe is not an easy task. These facilities are relatively easy to access, often open 24/7, and filled with personal property. It’s no wonder that about 1 in 10 property crimes in the U.S. occur in a parking lot or garage. That being said, there are a number of measures parking lot/garage operators can take to make their facilities more secure. And in doing so, not only do they make it more likely that criminals will be caught, in doing so, they make it more likely that criminals will avoid the secure premises altogether. Making an investment in parking security is certainly worth the results. Learn more about how to make parking lots and structures safer, below. 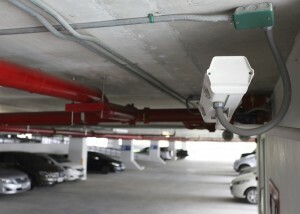 Facilities are taking steps to improve security in parking garages and lots. Emergency communications systems are an important component of any facility’s security plan, and parking structures are no exception. Emergency stations are a very common form of parking security, and are especially useful in underground structures where patrons may not have mobile phone service. They allow patrons to speak to facility security personnel instantly to get security assistance. They may also be equipped with a camera, and/or be able to broadcast security alerts from the facility. Access control can take parking security to another level. Patrons can be given special access cards to get into the facility, which allows operators to limit pedestrian points of entry. Access cards also can give operators greater insight into the number of vehicles in the facility at any given time, and even the owners of the vehicles. Security cameras can serve as a major deterrent against crime. Cameras should be placed throughout the lot/garage and should be clearly visible. Prominent signs should alert patrons that cameras are in use. Recorded video can be used to help identify perpetrators of crime. Video analytics can be used to take surveillance a step further. Analytics can be used for a number of purposes. For example, analytics can determine when a car has been left for a longer time period than normal, alerting the operator to the presence of a potentially abandoned vehicle. This entry was posted on Thursday, September 3rd, 2015 at 1:21 pm. Both comments and pings are currently closed.